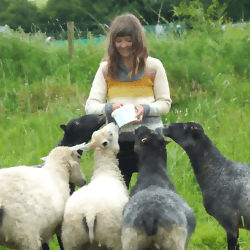 Hattie creates site-specific knitted garments from local materials around her home in Derbyshire, thereby developing an understanding of how the craftsperson experiences a deepening connection with their local landscape and community. By creating her materials and the ensuing garments from scratch, Hattie explores how the experience of producing crafted artefacts in this way, can also aid the development of understanding between craftsperson and their material, which draws links between this modern experience of making, and traditional rural craft. Her Masters by Research at Manchester School of Art is centered on the interconnections between Craftsperson, Material, Landscape and Community. Spinning, Natural Dyeing and Knitting. Researcher in to the interconnections between Maker, Material, Landscape and Community.